The Internet is filled with articles on how to be productive while working at home. They provide tips such as establishing a routine and having a schedule. However, running a home business has so many working parts that need to be manage simultaneously, that it can be hard for new entrepreneurs to prioritize every task that needs to be done. In many cases, home business owners spend too much time doing things that don’t lead to fast and profitable results. Here are suggestions for how to organize your day so that you're not wasting time, and your home business is making money. Many productivity books suggest that you don’t put email as your first to-do in the morning. Others recommend doing your hardest tasks first. But true productivity comes when you understand your peak work times and schedule your work accordingly. For some, settling into work-mode takes time, so starting with email is an easy way to start the day. For others, their energy drains after lunch, so it’s better to email in the afternoon, and to focus on more more important tasks in the morning while your energy is high. Some home business owners have several energy peaks and lows during the day. For example, they might be energized to work early in the morning and again late at night. In that case, working during those times, and doing something else during the late morning and early afternoon is the ideal schedule. Business management: Non-marketing or customer service email, doing the books, filing, etc. Most home businesses will have the ability to have a set schedule with repeating tasks. For example, a freelance writer can have a set time to write each day. A virtual assistant will have a set time to manage client social media and other tasks. While working from home allows for flexibility, it isn’t bad to have a routine for tasks you do regularly. A schedule creates a routine and habit, so you don’t have to think about what you need to do. It helps you organize and plan the non-regular aspects of your day around your normal activities. For a schedule to work, you need to stick to it. So if you find you’re procrastinating a lot, it’s time to go back to reviewing your peak work times or consider hiring a virtual assistant to do the non-money-making tasks you’re avoiding. The biggest challenge to home based business owners is dealing with distractions and managing the tasks that aren’t scheduled. Too often you’re interrupted by a phone call or an unforeseen issue (i.e. your website goes down), throwing your regular routine out of sync. Another issue related to managing your tasks has to do with activities related to long-term projects, which often get pushed aside for more pressing tasks. To best manage activities that you haven’t planned for, you want to assess their importance and either do it, schedule it, or delegate it. Do it: These are pressing issues or crises that must be dealt with. The challenge is in knowing if a task is so important that it automatically goes to the top of the list. Anything that can affect your income should be considered important. So if your website is down, you want to deal with it first. If a customer is complaining, you need to fix it fast. 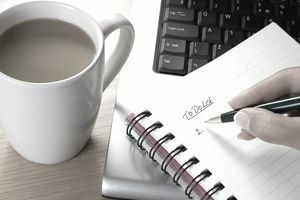 Schedule it: For to-dos that pop up that need to be done, but not necessarily ASAP, work them into your schedule later. Delegate it: Any time you can take a task off your plate, you’ll have more time to focus on the important money-making tasks. So if an issue pops up, and you have a good virtual assistant, see if he or she can deal with the issue. Break down the project into its to-dos. Pick a “Done” date when you want the project completed. Schedule in the to-dos from now until the done date. Treat them as "important" tasks that can't be put off. There are many great online and print systems to help you organize and schedule your day. The trick is to find the one that works for you. Digital systems often have web-based and smartphone apps so you can keep organized while away from your home office. Some home business owners prefer a print system and the ability to physically check off to-dos. Some people use a combination of both. If you’re not sure what’s best for you, test the various options, taking in consideration how you work, and how many cues, triggers or alarms you need to keep you on schedule. Ideally, you’ll want to schedule for the week, maybe even a month. However, it’s important to review and adjust your daily plan as needed.